Five years ago this week, Superstorm Sandy pummeled New York and New Jersey bringing with it one of the most devastating flood events in recorded history. Many homeowners in affected areas lacked flood insurance. 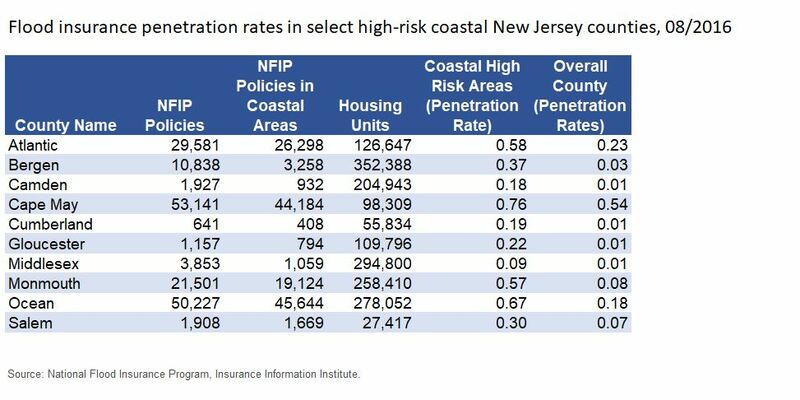 The two charts below show current flood insurance penetration rates in areas at risk for flooding. The pressures to rebuild quickly after a disaster can pose a challenge to the notion that immediately after a disaster is the perfect opportunity for creating more disaster resilient buildings and infrastructure. He concludes that we should try harder to argue for making the transformation at the time of the disaster and not give in to the political arguments where economic recovery is the number one priority. This month’s wildfires in Northern California burned more than 200,000 acres. Santa Rosa (Sonoma County) lost 3,000 homes and 400,000 square feet of commercial space, according to The Wall Street Journal (WSJ). Florida’s Assignment of Benefit (AOB) system—which allows a homeowner to transfer its insurance rights to a contractor—is clogging the state’s courtrooms with thousands of lawsuits, a Tuesday, October 24, WSJ print edition article found. Hurricane Nate caused insured wind-caused damage totaling anywhere from less than $500 million (Risk Management Solutions) to as much as $1 billion (CoreLogic). Nate made landfall as a Category 1 storm on the Louisiana-Mississippi border on the weekend of October 7-8. Five years ago this month (October 29), Superstorm (hurricane until a few hours before landfall) Sandy made landfall along the coast of New Jersey just northeast of Atlantic City. Sandy was one of the most devastating hurricanes to hit the northeast United States, causing more than 70 fatalities and $50 billion dollars in damage. It was the deadliest Northeast United States hurricane since Agnes (1972) and the 2nd most expensive United States hurricane on record behind Katrina (2005). 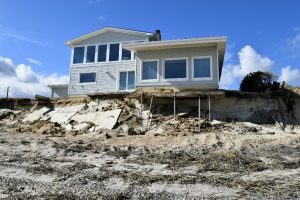 While heavy rainfall and strong winds were part of Sandy’s legacy, the primary cause of the massive destruction and damage that occurred was due to high storm surge levels. Sandy developed in the SW Caribbean on October 22 (Figure 1). This region is a typical hotbed for October Atlantic hurricanes. The system slowly intensified, eventually reaching hurricane strength before hitting Jamaica as a Category 1 hurricane. It briefly reached major hurricane strength (Category 3+ on the Saffir-Simpson Wind Scale) before making landfall in Cuba. 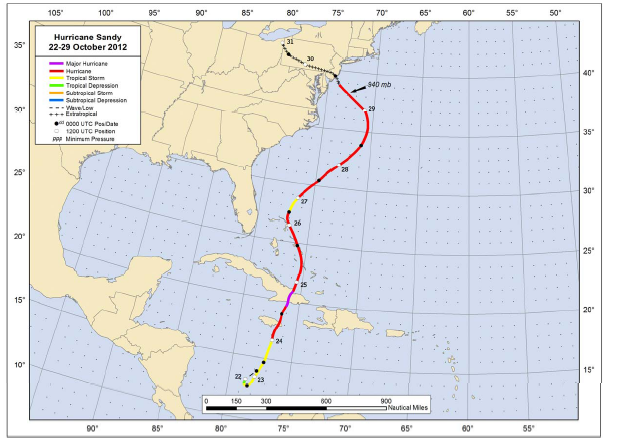 Figure 1: Track of Hurricane Sandy from its formation in the SW Caribbean until its dissipation in the northeast United States. Figure courtesy of National Hurricane Center. Landfall in Cuba weakened Sandy somewhat, and the system began to undergo structural changes as it interacted with a large upper-level low pressure area. This upper-level low caused the inner core to lose intensity, but it also caused the storm to grow considerably in size. Sandy weakened to a tropical storm, but then vertical wind shear (the change in wind direction with height in the atmosphere), began to abate and Sandy was able to re-intensify to hurricane strength. The storm, however, retained its large, sprawling circulation. (Figure 2). Tropical storm-force winds extended more than 900 miles away from the center of the circulation as it approached the United States coast, making it the largest Atlantic hurricane on record (since 1988). 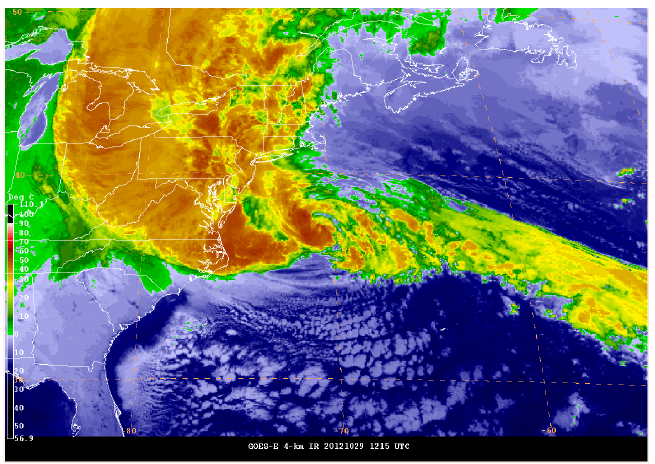 Figure 2: Infrared satellite imagery of Hurricane Sandy on October 29 showing the large, sprawling nature of its circulation. Figure courtesy of NOAA. 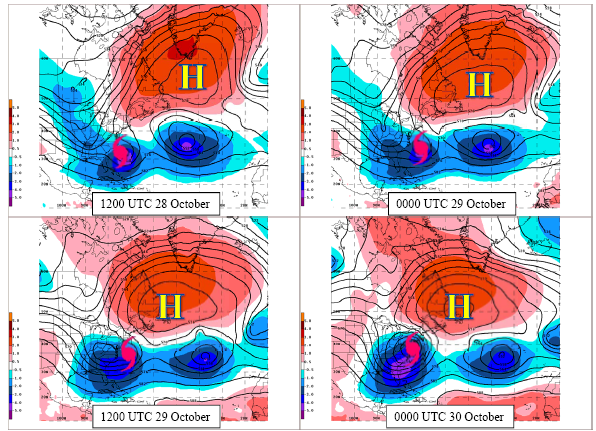 A large blocking high to the north of Sandy caused the storm to track to the northwest (Figure 3). Once Sandy had finished transiting the warm waters of the Gulf Stream and moved over cooler shelf waters near the New Jersey coast, it completed its transition into a post-tropical cyclone several hours before landfall. Figure 3: Mid-level weather pattern causing the anomalous track that Hurricane Sandy took. Strong high pressure to the north of Sandy prevented recurvature and caused Sandy to track towards the northwest. Figure courtesy of National Hurricane Center. While the maximum intensity at the time of its New Jersey landfall was 80 mph – equivalent to a Category 1 hurricane – the storm’s large size triggered huge amounts of storm surge. In addition, tides were running higher than normal, due to the lunar cycle; storm tide values shattered records in parts of New York City. At the Battery, Manhattan’s southernmost tip, the storm tide exceeded 14 feet, which was more than four feet higher than the previous record set during a winter storm in December 1992. 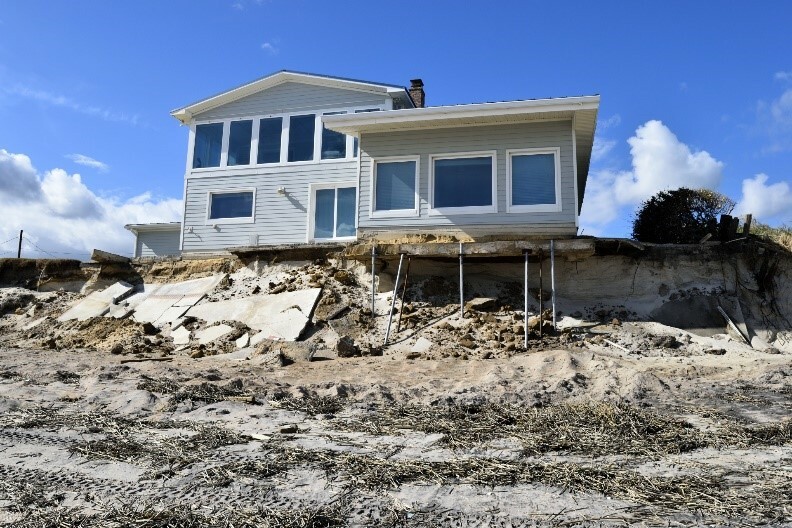 Many other areas along the coast of New Jersey and in New York City reported storm surge levels of 5-8 feet from Sandy which combined with astronomical factors to cause massive inundation. Sandy’s transition from hurricane to post-tropical cyclone immediately prior to landfall as well as the massive size of the system has helped us to refocus efforts in the five years since the storm to clearly delineate between the Saffir-Simpson Wind Scale category and potential impacts that the storm may generate. Just because a system transitions from a hurricane into a post-tropical system does not mean that its impacts have been ameliorated. While it has now been five years since Sandy’s landfall, it will forever be remembered in the northeast United States as an incredibly damaging storm. Q: Who is in charge of the cleanup? A: The clean-up will be done under unified command with California Office of Emergency Services (Cal OES), FEMA, the Environmental Protection Agency and the U. S. Army Corps of Engineers. A: This command structure is expected to expedite the removal of fire debris in Sonoma County, with a deadline of completion anticipated to be early 2018. 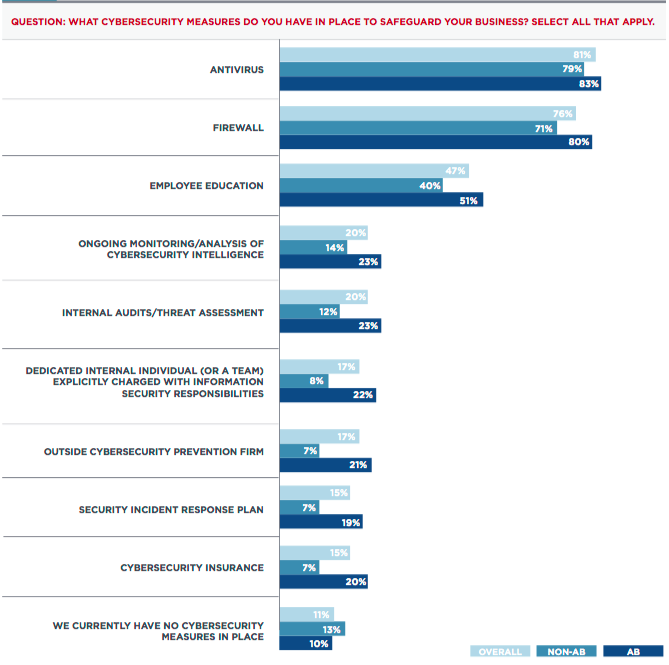 Q: What is the first priority? A: The first phase of the cleanup will be household hazardous waste and debris including propane tanks, burned out vehicles, air conditioners and refrigerators. Q: Will homeowners have to pay for the cleanup? A: Cal OES will accept insurance debris removal payouts as full payment. Removal will be free to homeowners who don’t have insurance. Q: Are homeowners required to participate? A: Homeowners can opt out of this program and hire their own licensed contractor to do their debris removal if they prefer. For more information on the recovery efforts visit sonomacountyrecovers. Now that the recovery process from Northern California’s deadly wildfires is under way, the largest debris-removal campaign in California’s history is in progress. Thousands of insurance claims are pouring in and the state insurance department has issued and expedited claims handling notice for all property/casualty companies. The Insurance Institute for Home Safety (IIHS) also has a series of wildfire related publications. And to be sure you are prepared in case of wildfire, I.I.I has this article: Preparing an Effective Evacuation Plan.